Dulcina Brookes-Byron, a 53-year veteran laborer at the Department of Agriculture on Nevis is the patron for the department’s 22nd Annual Open Day. She was honoured at the Opening Ceremony of the two-day event at the Villa Grounds in Charlestown on March 17, 2016. The 2016 Agriculture Open Day Patron can be considered a woman of strength, Mr. Evelyn said, who endured enormous hardship but never gave up. “When she took up employment in the field of Agriculture, she had to survive on a meager wage which didn’t see any major increases for a very long time. In her earlier days with the department, she worked hard and left her mark at all the government owned estates â€“ Indian Castle, New River, Eden Browne, Potworks, Cades Bay and Prospect. However, most of her work is concentrated at Prospect where she continues to work. Mr. Evelyn said Molly who has a quiet demeanor, continues to be respectful to her supervisors, loves her work and has no regrets regarding the 53 years she has spent so far with the department. Evelyn said the Ministry and the Department of Agriculture Co-operatives and Fisheries is delighted to honor one of their own. 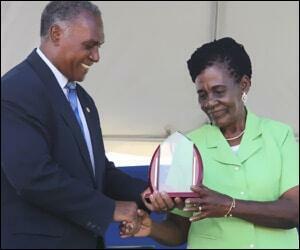 He thanked her for her hard work, dedication and contribution to the development of Nevis.